Tomoka State Park is an 1,800 acre park situated where the Tomoka and Halifax Rivers converge. It's a little over 3 miles from the park to the beach at Ormond Beach. There are approximately 100 campsites, and canoe and kayak rentals at the camp store. The nature trail is only a 1/2 mile long, but there are plenty of shorelines and natural areas to explore. You can see manatees and alligators within the park, as well as 160 different species of birds. My son, Austin trying to skip stones in the river. 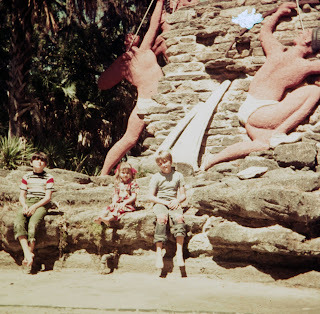 What the park is probably best known for it's famous statue. 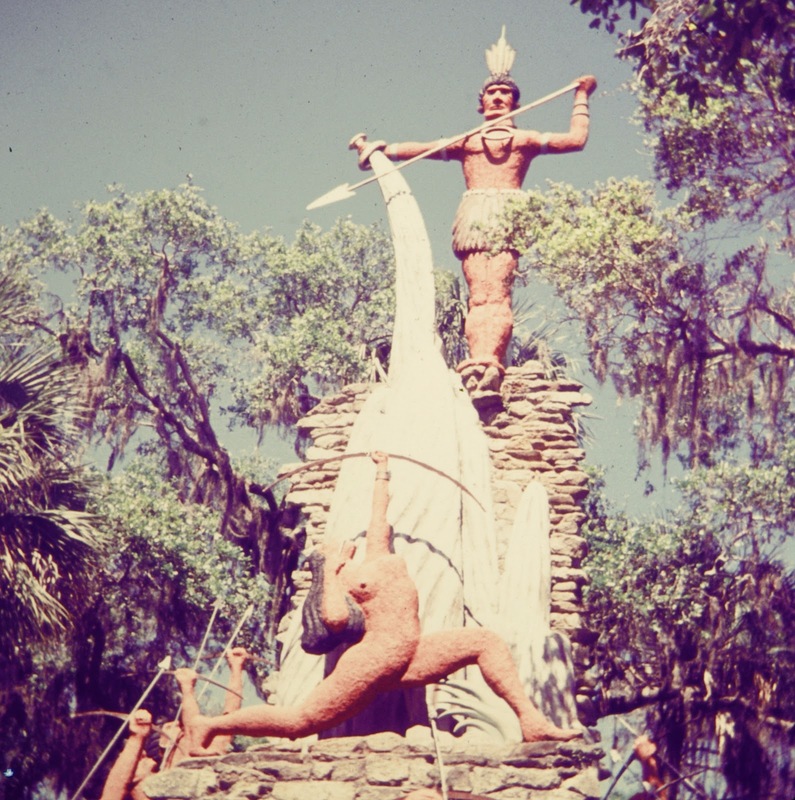 This statue has been around since 1955, and shows Chief Tomokie being slain by Oleeta for the golden cup. 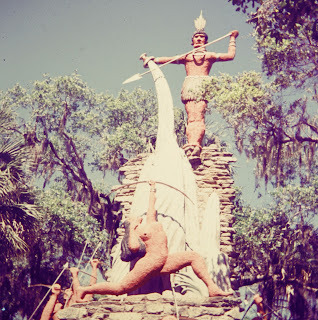 While the story is pure fiction, the Timucuan Indians did live in the village of Nocoroco on the same peninsula. It's interesting that the word "Tomoka" comes from Timucuan (closest the Spanish explorers could get to the native pronunciation). Pretty sad - old age and vandalism. The peninsula was also the site of an indigo plantation. The indigo plant was grown to produce a plant dye. It's where the color "royal blue" originally came from. They were having an exhibition showing how they used to make the dye. The indigo plants were crushed and boiled in a pot on an open fire. You can see the deep blue color on this yarn. The campsites are very large! Most of them are private from one another. They're great for RV's, campers and tents. With the two rivers on both sides of the peninsula, the park is a great place to canoe and kayak. There's even a state canoe trail. This picture is from the point of the peninsula. There are signs out in the water telling boaters to slow down for manatee. As you can see by the picture, the day we visited was not a good day for sightseeing on the water! Even with the cloudy weather, we still enjoyed ourselves! As I mentioned on the Ormond Beach page, the drive from Ormond Beach is very scenic! You go up North Beach Street right on the Halifax River. There are lots of great homes to see. And when you get past all of the homes - it gets even better! If you're in the Ormond/Daytona Beach area of Florida, we'd definitely recommend that you stop by!